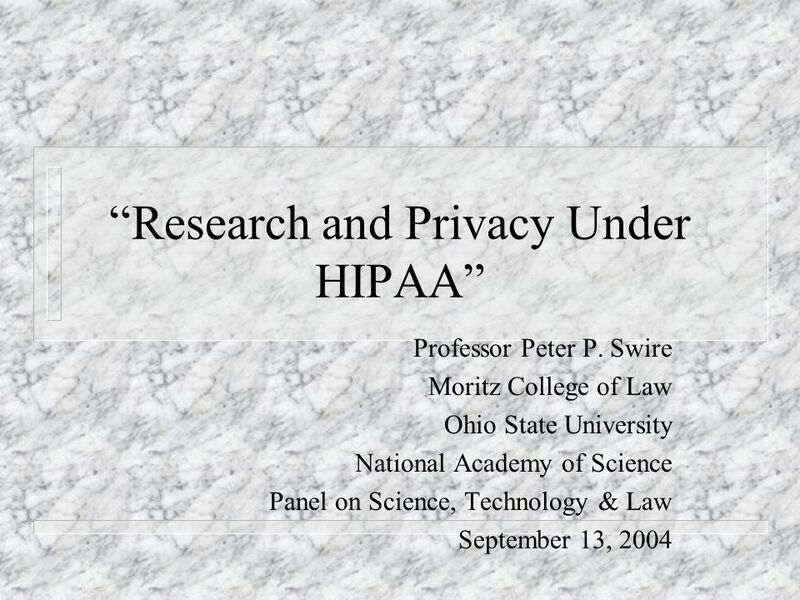 Research and Privacy Under HIPAA Professor Peter P. Swire Moritz College of Law Ohio State University National Academy of Science Panel on Science, Technology. 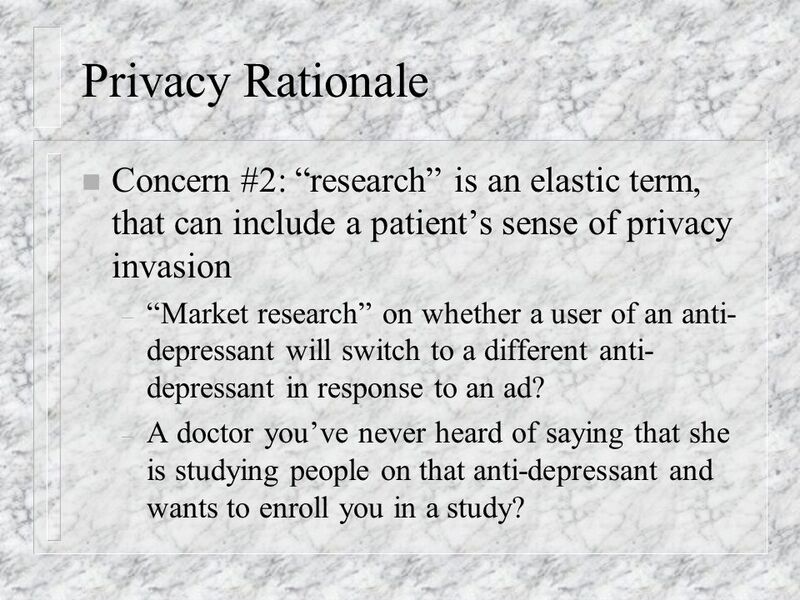 6 Privacy Rationale n Concern #2: research is an elastic term, that can include a patients sense of privacy invasion – Market research on whether a user of an anti- depressant will switch to a different anti- depressant in response to an ad? – A doctor youve never heard of saying that she is studying people on that anti-depressant and wants to enroll you in a study? 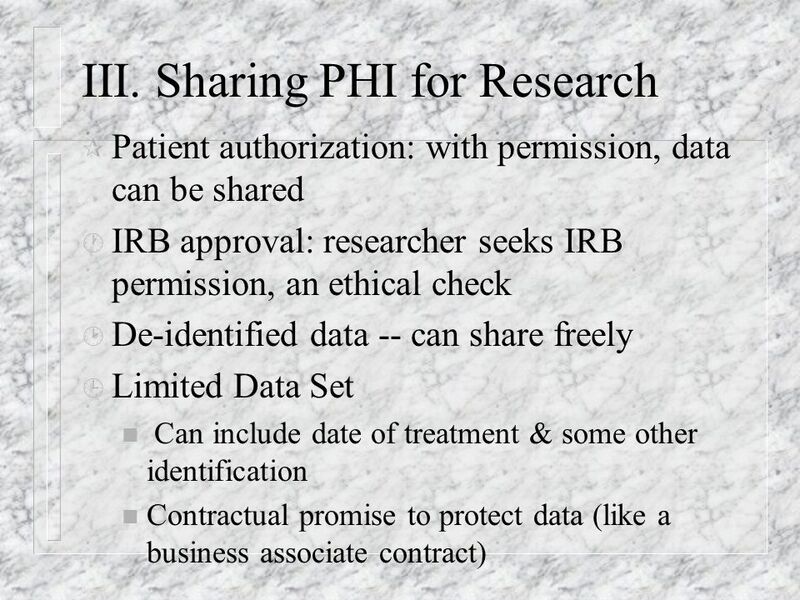 Download ppt "Research and Privacy Under HIPAA Professor Peter P. Swire Moritz College of Law Ohio State University National Academy of Science Panel on Science, Technology." Tamtron Users Group April 2001 Preparing Your Laboratory for HIPAA Compliance. 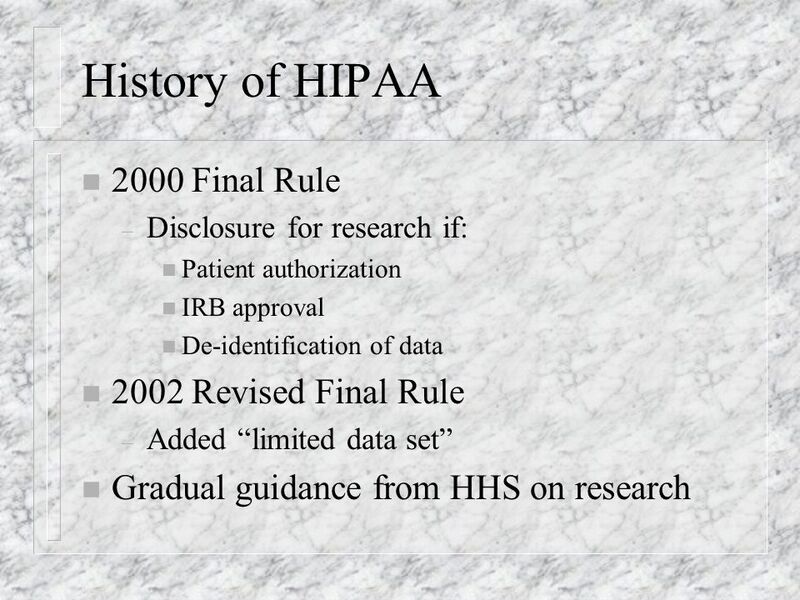 Fourth National HIPAA Summit April 26, 2002 Implementation of a HIPAA Data Management Strategy Safeguarding privacy interests while making data available. 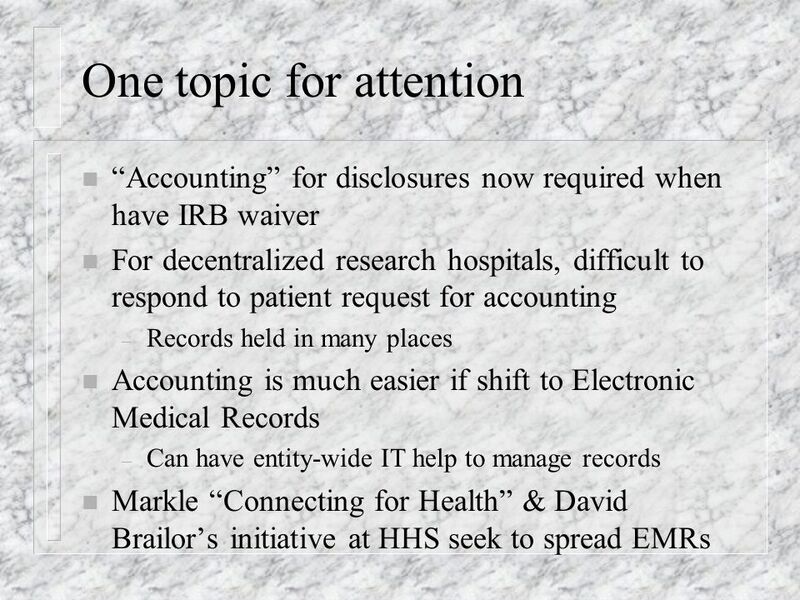 Presented to Second Annual Medical Research Summit Washington, D.C. by Mark Barnes ROPES & GRAY March 25, 2002 APPLICABILITY OF HIPAA TO RESEARCH AND CLIINICAL. 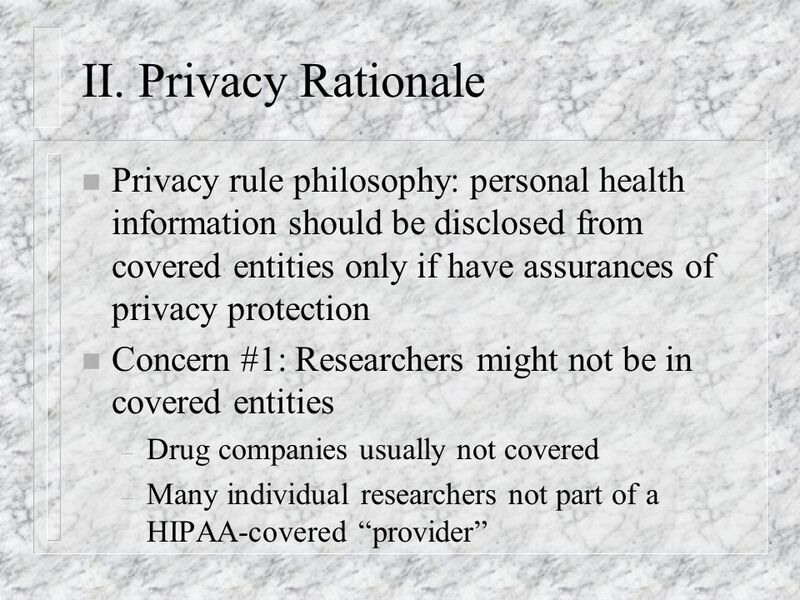 Medical Privacy in a Broader Privacy Context Professor Peter P. Swire George Washington Law School Former Chief Counselor for Privacy, U.S. Govt. HIPAA. The Chief Privacy Officer for the U.S. Government Professor Peter P. Swire Ohio State University Visiting, George Washington University Privacy Officers. "Security and Privacy After September 11: The Healthcare Example Professor Peter P. Swire Ohio State University Consultant, Morrison & Foerster LLP April. HIPAA In Relation to Other Federal Laws Professor Peter P. Swire Ohio State University Consultant, Morrison & Foerster LLP Glasser LegalWorks/HIPAA Conference. Privacy in America: Your Role as Guardians of the Publics Data Professor Peter P. Swire Moritz College of Law The Ohio State University Ohio Digital Government. HIPAA and the War on Terrorism Professor Peter P. Swire Ohio State University Consultant, Morrison & Foerster LLP HIPAA Summit West June 7, 2003. Mental Health Issues & Information Sharing Professor Peter P. Swire The Ohio State University NAAG Task Force on School Safety July 5, 2007. 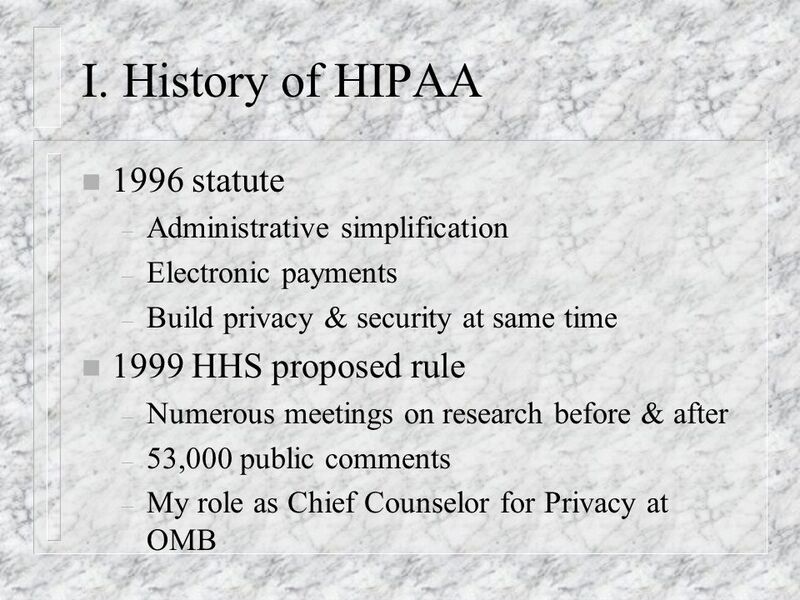 SIMPLIFYING PRIVACY: HIPAA PRIVACY STANDARDS AND RESEARCH Angela M. Vieira General Counsel Childrens Hospital and Health Center June 5, 2004. Todd Frech Ocius Medical Informatics 6650 Rivers Ave, Suite 137 North Charleston, SC Health Insurance Portability. 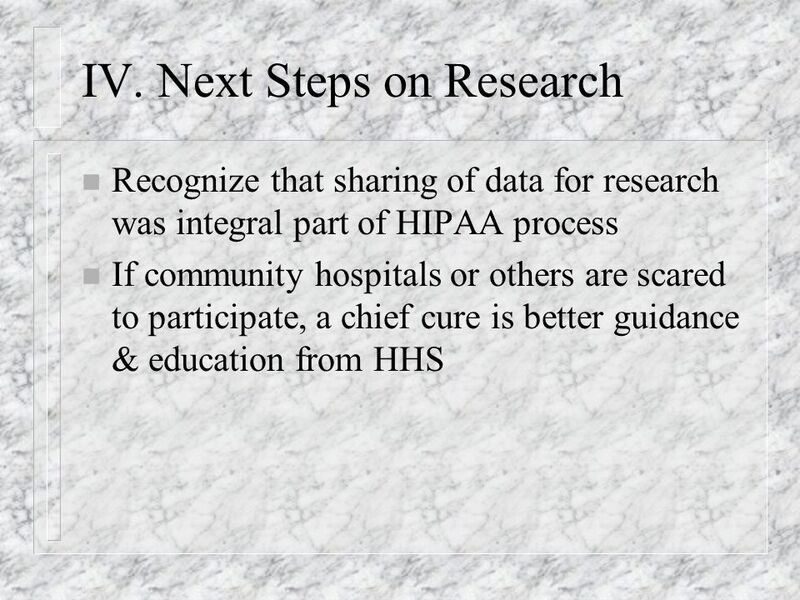 HIPAA: Privacy, Security, and HITECH, Oh My! 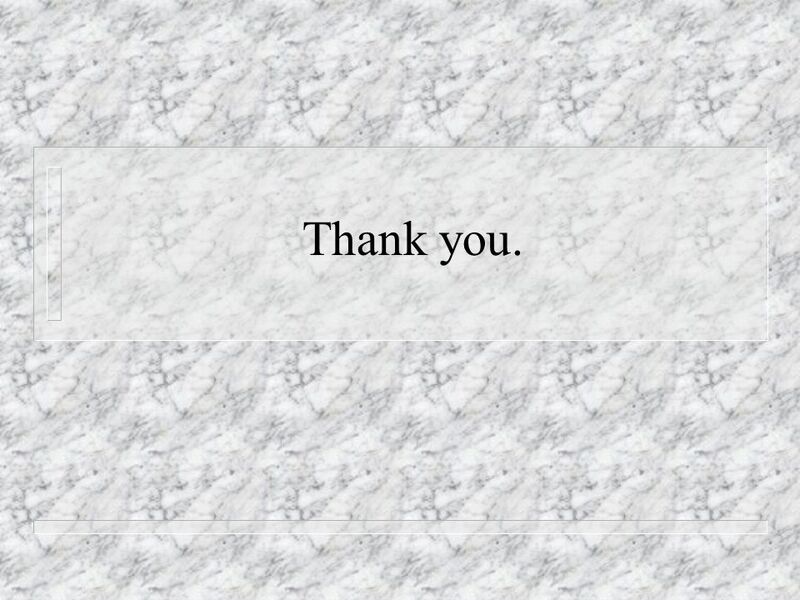 Presented by Stephanie L. Ganucheau, Special Assistant Attorney General.